Oh I waited for this one and got it within minutes of it’s becoming available. (I happened to be up in the wee hours on 6/23). Imo, Burke has been going a bit downhill in the last few years but I’m still optimistic. And Will Patton is far and away his best narrator. So here we are in the north country of Montana, NOT the Bayou Country and that’s a point against the book already. Patton is doing his best to over-read this – not good. Looks like we have a bit of the fem-jeop in play here – perhaps over-the-top? I hope not. I know it’s hard to have a small-town private detective find murders in his own community every couple years for decades. Many authors have to resort to travel or organized crime to extend their very successful series and maintain some level of credibility. Burke had Robicheaux vacation in Montana for Swan Peak a few books ago, (before the organized international crime book and the serial femicide book) and he’s touched on the occult in a couple books, so this might not be too bad. Patton is not anywhere near as authentic with a Montana twang as he is with a Louisiana drawl. Still, I’m going to wait and see – I have loved James Lee Burke – Dave Robicheaux and Clete for many, many years, through the whole series. So the whole gang is on vacation, Dave and Clete, Molly who is Dave’s wife (3rd I believe), Alafair Burke who is Dave’s adopted daughter, and Gretchen, Clete’s daughter who was just introduced in Creole Belle, #19 in the series. A few days prior to the Robicheaux group’s arrival a young Indian girl named Angel was found abused and killed by an arrow. And right after the group arrives someone shoots at Alafair with an arrow and they find some very strange”Biblical” type writings in a cave – the plots are already threading. Alafair feels threatened not only by the arrow, but by some cave wall writings as well because they sound very, very much like a letter she received from one Asa Surette, a serial killer who is apparently not quite as dead as has been assumed. Alafair had written several articles leading to a book on Surrette. She’s convinced he is truly evil as is Dave. Gretchen is physically attacked by a Bill Pepper from the local police department – that man has some problems. She now sleeps with her gun. Then he’s found dead. The Indian girl turns out to be the daughter of Caspian Younger and granddaughter of Love Younger, local rich and powerful of the oil baron variety. 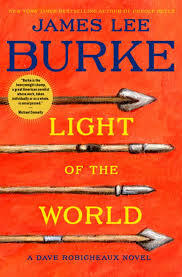 Burke has become more and more political in his latest books – he’s quite liberal and it’s quite refreshing. But perhaps he philosophizes on the nature of evil a wee tad too much here – has Robicheaux doing it for him. There are other characters around. Wyatt Dixon, a rodeo rider is still in town – he was a character in Burke’s Billy Bob Holland (Montana) series. He believes the writings on the wall refer to Satan and also believes Satan is there – in the community. Rhonda, a local waitress, is kidnapped and held and Dave, Clete, Gretchen and Alafair each approach this event from their own angles. Dave goes after the clues to the girl’s whereabouts via a share at an AA meeting, Clete goes after Love Younger’s wife, Felicity who joins in the hunt, Gretchen approaches via Wyatt who has connections, and Alafair goes after Asa. It’s a pretty complex novel, written in the lush style only Burke can bring to a crime novel.